Published in Candollea 22: 21. 1967. Type: Greenland, Liverpool Land, east side of Hurry Inlet, Kalkdal, 70o50N, 22o20W, 10.07.1993, Sørensen 359a. According to Bocquet, Candollea 22: 21.1967. Holotype: DAO. Synonymy. Lychnis sorensenis B. Boivin, Canad. Field-Nat. 65: 6. 1951. Lychnis triflora R. Br. ex Sommerf., Mag. Naturvidansk. 2: 152. 1824. Melandrium triflorum (R. Br. ex Sommerf.) J.Vahl, Fl. Dan. 14, 40: 5, t. 2356. 1843. Gastrolychnis triflora (R.Br. ex Sommerf.) Tolm. and Kozhanch., in Tolm., Fl. Arct. URSS 6: 112. 1971. Vegetative morphology. Plants 4–15(–30) cm high; perennial herbs; caespitose. Taproot present. 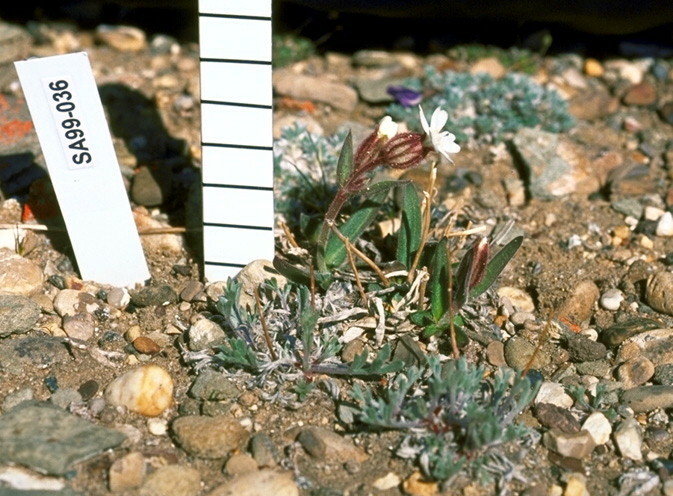 Ground level or underground stems absent. Caudex present (compact sometimes branching zone at ground-level). Aerial stems erect. Aerial stem trichomes spreading, or erect (hairs with red cross-walls). Leaves mainly basal; opposite; marcescent. Petioles absent. Leaf blade bases attenuate. Blades 1.5–3(–8) mm long, 2–4(–8) mm wide, spreading, oblanceolate (oblong), flat, appearing single-veined. Blade adaxial surface dull, glabrous or hairy (rarely), hairs pilose or strigose (if applicable), hairs simple. Blade abaxial surface glabrous or hairy, hairs pilose or strigose, hairs sparse, hairs white (if applicable). Blade margins with non-glandular hairs; apices acute. Reproductive morphology. Flowering stems with leaves (usually 1–2 pairs of opposite lanceolate leaves). Flowering stems hairy. Flowering stems villous (or densely woolly). Flowering stem hairs simple; white or translucent and transparent with red cross-walls; glandular hairs present (sometimes viscid). Flowers in inflorescences, or solitary. Inflorescences with flowers in a dichasium. Flowers per inflorescence 1–3; medium-sized. Sepals conventional; 5; fused; 9–14 mm wide; purple, or green and purple; membranous with prominent ribs (partially obscured by dense glandular viscid pubescence); accrescent. Calyx ovoid; 5-lobed; hairy. Calyx hairs pilose, or villous; glandular (even more so than S. involucrata); transparent with red cross-walls (especially on the ribs). Calyx teeth equal or nearly so; 2–3 mm long. Petals conventional; free; longer than the calyx; 5; white; obovate; deeply cleft; 11–15 mm long (considerably exserted but soon wilting). Stamens 10; stamen filaments glabrous. Anthers yellow; ellipsoid; 0.8–1.1 mm long. Ovary superior; carpels 5; syncarpous. Ovaries oblong; glabrous. Styles 5; free; 4–6 mm long. Stigmas per ovary 1. Placentation free central. Ovules per ovary 40–60. Fruit with calyx persisting; dry; a capsule; oblong; yellowish; 8–12 mm long; 4–5 mm wide; surface appearing veinless; dehiscent; opening with teeth at the top of the capsule; teeth 5 (often splitting into 10). Seeds numerous; 0.8–1 mm long (angular); brown; surfaces verrucose (wingless). Chromosome information. 2n = 72. 2n (6x) = 72. Böcher and Larsen (1950, Greenland); Nygren (1951, Greenland); Holmen (1952, Greenland); Jørgensen et al. (1958, Greenland); Mosquin and Hayley (1966, northern Canada); Zhukova and Petrovsky (1972, Wrangel Island); Petrovsky and Zhukova (1981, Wrangel Island). Ecology and habitat. Substrates: river terraces, tundra, slopes, cliffs, seashores, barrens; imperfectly drained moist areas, dry, moderately well-drained areas; rocks, gravel, sand, silt, clay (hummocks); with low organic content; calcareous. On calcareous clay and gravel of fresh moraines and stony barrens of the northernmost islands of the Archipelago (Porsild 1957). 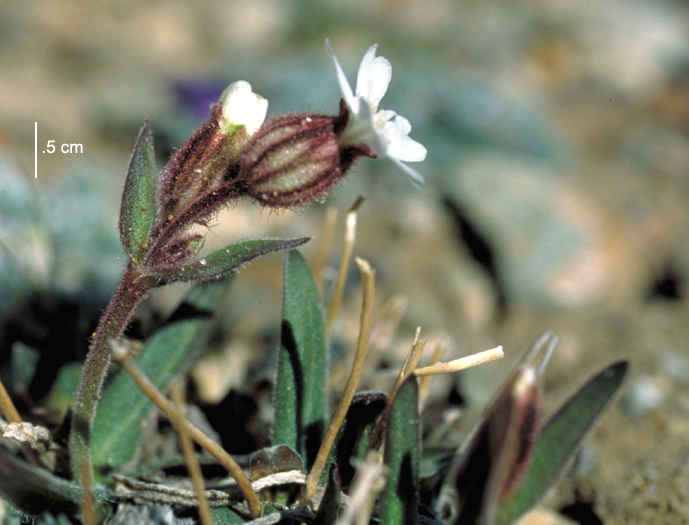 Common in not too dry, stony, gravelly, or sandy places, rarely in moist, grassy situations (Porsild 1957). Moderately drained sandy peat (CAN 535386); recent clay heaps near the shore (CAN 267605); well-drained, laminated sand with widespread erosion. Sediments consisting of saturated organics over silt and sand: a colonising species of disturbed terrain (CAN 532965); edges of Cassiope heath on dry gravel (CAN 301952); on grassy slope (CAN 259277). North American distribution. Alaska (? ), Northwest Territories Islands, Nunavut Islands. Range in the Canadian Arctic Archipelago limited. Uncommon. High Arctic. Arctic islands: Baffin, Ellesmere, Axel Heiberg, Parry islands (Emerald, Melville and Prince Patrick), Banks, Victoria (Bylot Island). Northern hemisphere distribution. Amphi-Beringian (slightly), or North American. Taimyr  Severnaya Zemlya (? ), Wrangel Island, East Chukotka (? 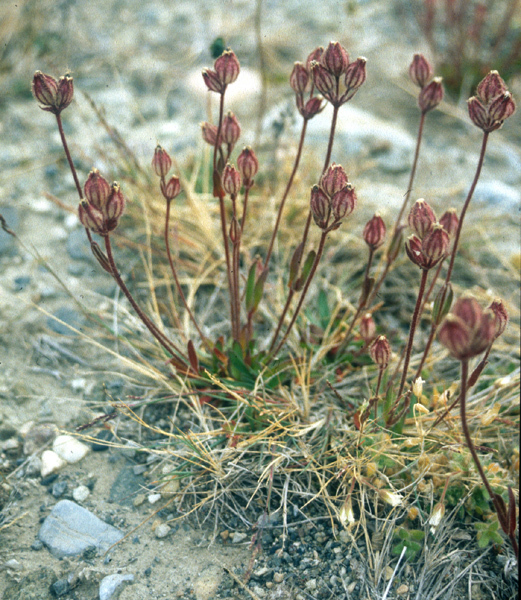 ), North Alaska  Yukon (? ), Central Canada, Labrador  Hudson Bay, Ellesmere Land  Peary Land, West Greenland, East Greenland. General notes. 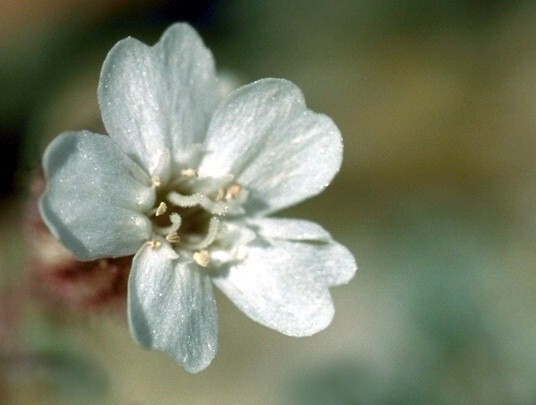 Silene sorensenis is restricted to Greenland, northern parts of the Canadian Arctic Islands, and Wrangel Island. It is characterised by pale pink, much exserted petals, ovate-campanulate calyx, and small (ca. 1 mm) wingless seeds. It is usually separable from the other arctic Silenes by its dense purplish pubescence, which tends to obscure the venation of the calyx (Morton, 2005). The flowering stems are usually stouter and stiffer than in S. involucrata. Illustrations. • Habitat. 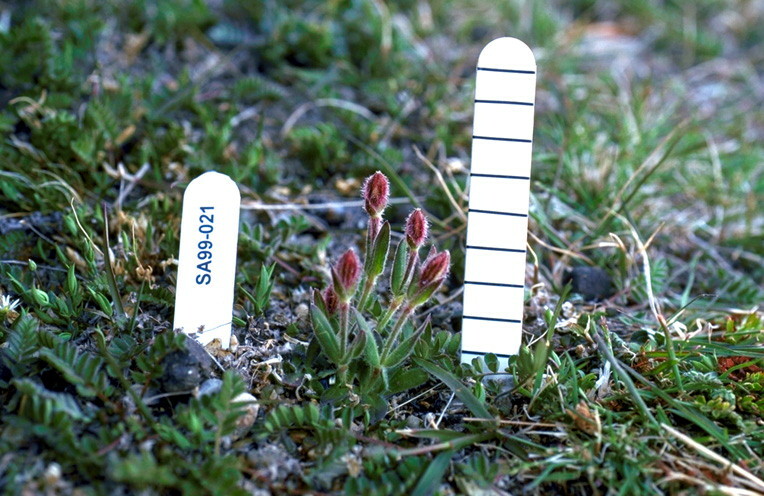 Plants in bud thriving in additional nourishment from muskox remains around food caches at an archeological site. N.W.T., Banks Island, Aulavik National Park. 7 July, 1999. Aiken 99–021. CAN. Scale bar in cm. 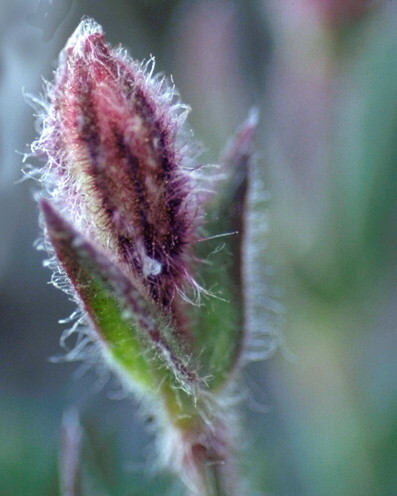 • Close-up of plant in bud. 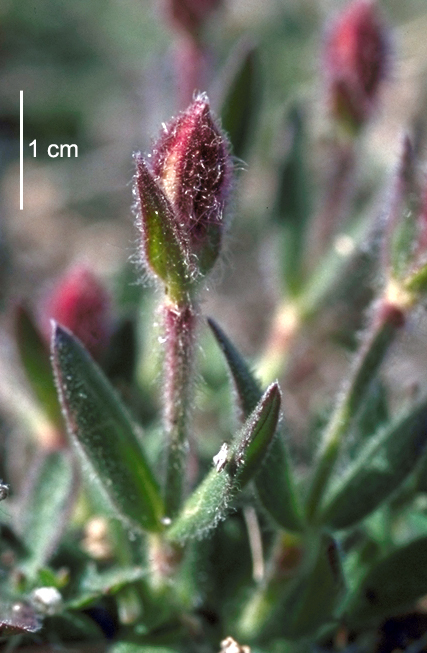 Flowering stems with pairs of sessile leaves and buds with reddish hairy fused calyces. N.W.T., Banks Island, Aulavik National Park. 7 July, 1999. Aiken 99–021. CAN. Scale bar in cm. • Close-up of bud. Calyx densely pubescent and with dark lines of purple colour on the veins. N.W.T., Banks Island, Aulavik National Park. 7 July, 1999. Aiken 99–021. • Habitat: Banks Island. Plants in flower, growing in gravel. Note the fused, ovoid-shaped calyx that is inflated and has prominent reddish lines. The petals are white and notched and much exserted. N.W.T., Banks Island, Aulavik National Park. 9 July, 1999. Aiken 99–036. CAN. Scale bar in cm. • Close-up of plant. Flowering stem with two flowers and a young bud. Note the fused, ovoid-shaped calyx that is inflated and has prominent reddish veins, the dense glandular pubescence of dark purple hairs and the white, notched petals which are much exserted. N.W.T., Banks Island, Aulavik National Park. 9 July, 1999. Aiken 99–036. CAN. • Close-up of young flower. 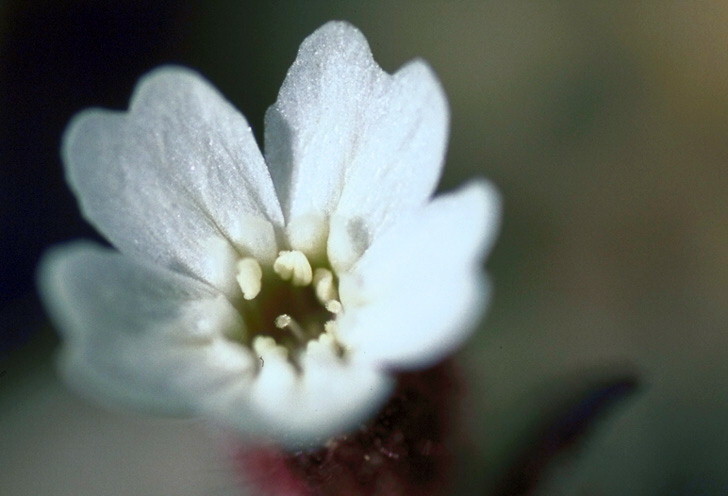 Newly opened flower with notched white petals that have two raised insect guides and anthers between the guides of each petal and between adjacent petals. Note the stigmas are still young. N.W.T., Banks Island, Aulavik National Park. 7 July, 1999. Aiken 99–036. CAN. • Close-up of mature flower. Fully opened flower, in the centre of which is a style with five mature stigmas, and ten stamens with dehisced anthers. N.W.T., Banks Island, Aulavik National Park. 7 July, 1999. Aiken 99–036. CAN. • Close-up of plant in fruit. Note the dense three-flowered inflorescences and inflated calyx. Greenland, Thule, AFB. August, 1999. Photograph by R. Elven. Voucher at 0. • Arctic Island Distribution.